The owner of Box 388 advertises that a "Colored Man Wanted," for their property 2 miles from Lakeland, Florida. Cypress logs are also being sought. A Georgia man tries to enlist when he hears his son is KIA, but is rejected for being under weight. The USDA is actively researching which grapefruit and orange varietals are best suited to the Florida climate. 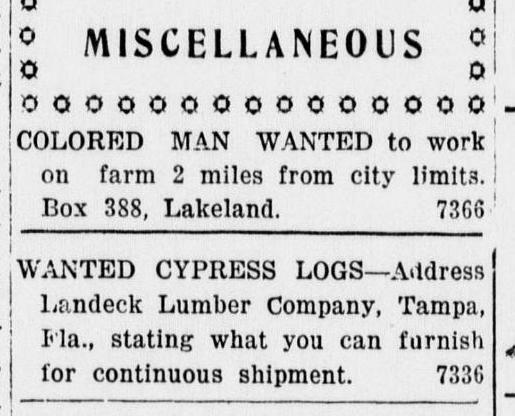 Source: "Colored Man Wanted," Lakeland Evening Telegram, Lakeland, Florida, March 26, 1918. Page 6, Column 3.